08/09/2014 Darling Of The Day: ‘If I Stay’ Star Chloe Grace Moretz! Summer is certainly in full swing, but we can look to the red carpet to see what’s coming for fall on our favorite celebrities. This includes the young & sophisticated Chloe Grace Moretz, star of the highly anticipated YA adaptation If I Stay. At a recent book signing, the actress wore tailored trousers with a multicolor shirt & metallic pumps. I was so inspired by this look, especially since I’ll be headed back to work next month & will need to start transitioning from sandals to stilettos. Of course when you put a look like this together, you can reinterpret the separates in many different ways. 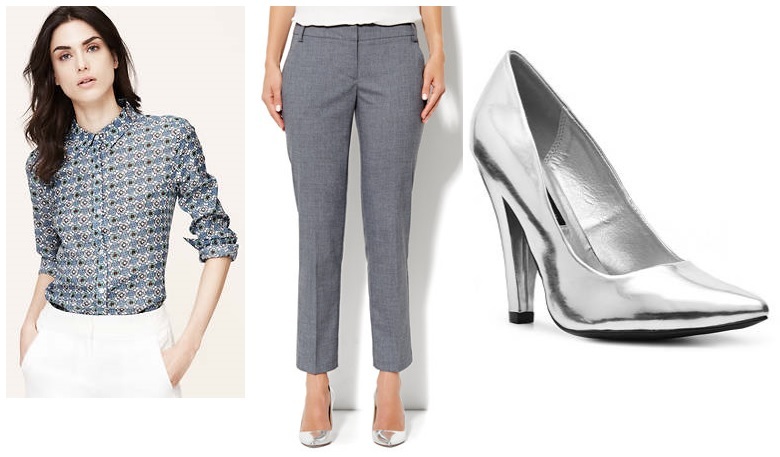 The essential ingredients are easy: a button down shirt, tailored trousers, & pointy toe pumps. This outfit would also be uber-chic if worn monochromatic in white or red, as well as using menswear inspiration. To achieve this look, I found some affordable pieces that can certainly be mixed & matched for a variety of looks for day, night, & anything in between. The floral tile softened shirt ($22.00) from LOFT is currently 60% off. While it doesn’t share the same glitz as Chloe’s sequined shirt, you an easily bling it up with some oversized jewels or pearls. The 7th Avenue City double stretch slim ankle pant ($54.95) from New York & Company are BOGO 50% off, & can be very work appropriate, as well as fun for a night out with an embellished top & strappy sandals. As for the shoes, I found the Heart Soul Gizelle pump ($24.94) in silver from DSW, which add that extra special posh touch. What are your favorite menswear inspired pieces? How would you wear a look like this? Where are you shopping for your fall must-haves? Happy Styling! This entry was posted in Accessories Access, Basics for a Bargain, Darling Of The Day, Luxury Look-Alikes For Less, Quickie Darling Deal & Steal, Red Carpet Review, Show Me The Shoes, Splurge or Save?, Style Darling Daily and tagged Accessories Access, Basics for a Bargain, button down shirt, Chloe Grace Moretz, Darling of the Day, DSW, Heart Soul, If I Stay, LOFT, Luxury Look-Alikes for Less, menswear inspiration, metallic pumps, New York & Company, pointy toe pumps, Quickie Darling Deal & Steal, Red Carpet Review, Show Me The Shoes, Style Darling Daily, tailored trousers. Bookmark the permalink. ← Splurge or Save… On A Calvin Klein Dress?